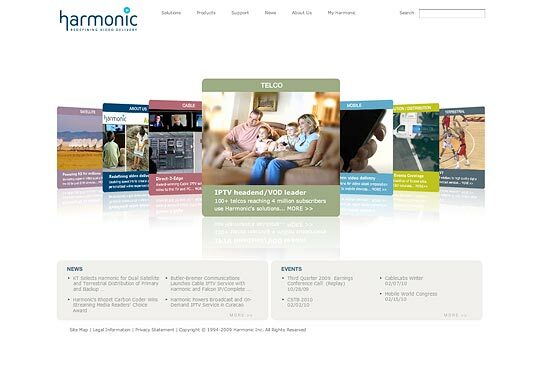 Harmonic needed a way for users to get a comprehensive idea of each of company's 7 divisions on homepage. This solution is a remarkably smooth, xml-driven, flash engine. The xml allows site administrators to control, video content, card copy and colors. Squarely positions Harmonic as industry thought and technology leader. We hired a casual game company to do the programming. All 7 divisions were pleased. Lucky 7. XML drives the carousel, controls the colors, the videos and the copy. Videos play in each card as user makes selection. Fun, "Casual Game-Quality" offers User ergonomically pleasurable experience, holding their attention. Web Design	/	Project	ManagementFull service capabilities to design and deploy compelling web presence. Mobile Ads, Web 2.0 Strategies. Designed by Alan Patten — You will have gold pieces by the bushel.